Like many organizations, Pets In Need depends on dedicated volunteers to help the staff provide a higher standard of care for our animals. We have volunteers helping in many different capacities but one of our larger areas of volunteer involvement is working with our dogs. 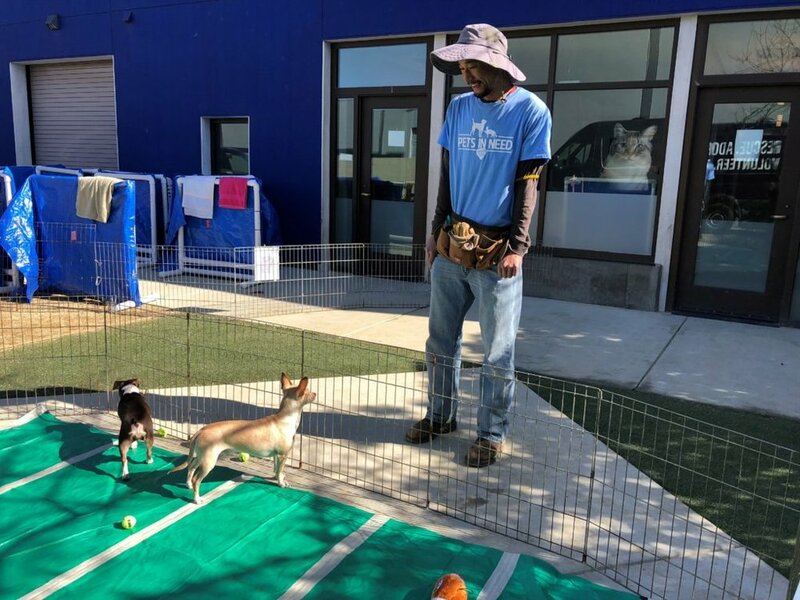 We chose to highlight one particular dog volunteer who, since starting last fall, has dedicated countless hours a week to work with our shelter dogs. Alex has been a wonderful addition to the Pets In Need team and his passion for learning about dog behavior is evident in all the work he does at our shelter. We asked Alex to sit down with us and answer a few questions about himself and his experience volunteering at Pets In Need. You have said that your dream is to become a dog behavior consultant. How did you first get interested in dog behavior? I think it may have happened from growing up being around fish, insects, reptiles, amphibians, dogs, cats, horses, donkeys, cows, chickens, rabbits, also some other large and small mammals and birds both domesticated and wild, etc. I also grew up with a strong interest in personally catching, observing, and releasing lots of insects, reptiles, amphibians, fish, small mammals, and other creatures. I seriously considered pursuing entomology, fisheries biology, and herpetology but I think over time I naturally gravitated towards dogs, then eventually to dog behavior in efforts to understand the one I call “my best friend/buddy in the whole wide world” to the best of my abilities to ensure that my best buddy and all dogs are as happy and comfortable as possible. The work you do as a PIN Playgroup Monitor is a great way to hone your canine body language observational skills. Tell us about the other efforts that you’re making to improve your understanding of animal behavior. In addition to the Playgroups, and in general spending as much time as possible at PIN interacting with the dogs (and occasionally cats! ), my ongoing efforts to improve my understanding of animal behavior include reading books such as “On Talking Terms With Dogs: Calming Signals” by Turid Rugaas (also watching her DVD, “Calming Signals: What Your Dog Tells You”) and “How to Behave So Your Dog Behaves” by Dr. Sophia Yin (also taking the course “Low Stress Handling Silver Certification” offered by her legacy company Cattle Dog Publishing). I also have a subscription to Whole Dog Journal because they often feature really awesome articles. Dog Watch published by Cornell University's College of Veterinary Science also has really good articles. What is the most rewarding part of volunteering at PIN for you? I really appreciate PIN a lot and think they are absolutely amazing because in addition to encouraging humans to learn about dog (and cat!) body language, they have protocols to minimize stress and to ensure the safety of both the dogs and humans. Some of the protocols are for: Shy dogs, General Safety, Jumpy-Mouthy Dogs, Easy Leash-Up, Safe and Minimal-Stress Animal Handling, and it can be awesome positive reinforcement to recognize basically all of the information from the PIN protocols in the various materials I read or watch and in the courses I’ve taken in my efforts to better understand dogs and animal behavior in general. It is also extremely powerful positive reinforcement that the protocols are super effective when put into practice. If one were to read the various PIN protocols and put them into practice, they might gain extremely valuable and useful information on dog behavior and safe handling techniques, which may also save them from possibly hundreds of hours of trying to obtain the same information from other sources. Also, the dogs you interact with may appreciate you more! In addition to the Playgroups, being able to observe and interact with all the different dogs in the shelter environment can also be awesome opportunities for learning and extremely rewarding, as they all have such unique personalities and life experiences that shape each one into the individual that they are at this moment. Learning about dog behavior on a screen or reading about it can be awesome, but it is an absolutely amazing opportunity to get the in-person, hands on opportunity to put that learning into practice by interacting with so many individuals who all exhibit different behaviors shaped by their unique life experiences and personalities. We want to thank Alex for all his hard work and dedication to our organization. We truly could not do all the things we do now without passionate volunteers like Alex. If you are interested in becoming a volunteer at Pets In Need, visit the Volunteer page our website for orientation dates.